It is that time of year to start slowly and calmly start thinking about what you want your classroom to look like when school begins...but no pressure here. It is still summer. 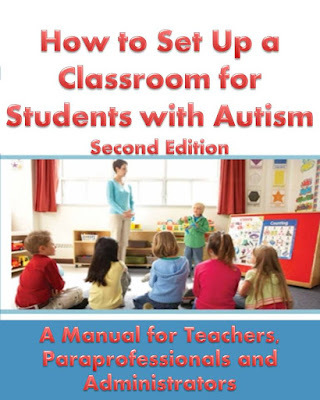 However, it's probably time for me to do a slightly detailed exploration of the book How to Set Up a Classroom for Students with Autism-Second Edition. I say this because, this is the type of information you want to take in a little at a time. The book begins with some information about autism, strengths of individuals with autism, and implications for teaching. This beginning chapter also outlines the 10 main strategies that will be discussed in the book. What else does it talk about? First Things First - You need to know that this is a process and will take time. Also, you will need to gather materials and check with your school to see if they have some of those materials. Most importantly, the First Things First chapter gives about 15 ideas (if you need ideas) for para-professionals on what to do those first few days of school to get the classroom ready. There is a set of discussion questions at the end of each chapter to help if you are using the book for professional development or if you just want to better analyze what you read. Additionally, there is a list on the first page of each chapter that teachers and administrators can use to identify key elements in the classroom. And, how can I forget, there is a "GAME PLAN" at the end of each chapter to tell you exactly what to do to get started implementing what you have learned. The assessment chapter, of course, describes some assessments that are important for students with significant special needs. The schedules chapter, of course, talks about a variety of schedules. But more importantly, it tells you why to use them. And, it gives ideas for creating them. The classroom environment chapter provides a detailed checklist and TONS of information about setting up the various area of the classroom. This is my favorite chapter! Data collection is always a hot topic and it is addressed with a few samples. Those looking for ideas for how to motivate a classroom team, will find it in this book too. With a behavior support chapter, a sensory chapter and sample templates for routines and lessons, this book always lives up to its nickname "a mentor teacher in a book." It is available through purchase order at discounted bulk prices at AutismClassroom.com. It is also available online in paperback and electronically at any major book seller, through AutismClassroom.com or through Teachers Pay Teachers- Autism Classroom Store.